All of us here at St. Luke’s are so pleased that you are thinking of having your child Baptised (or Christened, as it is sometimes called). The birth of a child is a wonderful thing, and we all share in your joy as a new human being enters the world. 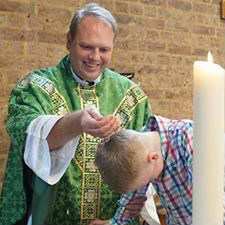 Baptism is an important and wonderful step in your child’s life, and in the life of his/her parents and wider family. The information here will hopefully answer some of the questions that you may have about your child’s Baptism, and also will explain how this important sacrament is administered at St. Luke’s. If you would like to find out more, and / or arrange for the Baptism of your child, please give Fr. James a call, or even better, come along to a Sunday Service and catch him afterwards! Normally Fr. James will then come and visit you at home, and during that time will agree a date with you. The choice of God Parents is an important decision. They, with you, will be concerned with the spiritual and moral welfare of your child. Choose carefully, and perhaps pray about your choice. It is usual for a girl to have two God Mothers and one God Father, and for boys to have two God Fathers and one God Mother. All God Parents should be baptised, and preferably confirmed. Baptism takes place within the 10.30 Sunday Mass, and the whole worshipping community here at St. Luke’s will be present to support you and your child with their prayers, and welcome a new Christian into the family of the Church. You child will be Baptised towards the middle of the service after the Sermon. You and your child’s Godparents will be asked to make several very important promises during the service, during which you will publicly state your commitment to the Christian faith, and your desire to turn to Christ, our Lord and Saviour. These promises will be explained to you by Fr. James when he visits you. After the service you will be given a certificate of Baptism that will need to be kept safe. We hope you will enjoy your experience of St. Luke’s, and hope and pray that you and your child will want to become regular members of our congregation, and learn more about the faith into which your child has been Baptised. All of us will be only too pleased to offer any help that we can, and you can be assured of a warm welcome for you and your child at any of our services or events.